72% of women survive ovarian cancer for at least one year, and this is predicted to fall to 46% surviving for five years or more, as shown by age-standardised net survival for patients diagnosed with ovarian cancer during 2010-2011 in England and Wales. Ovarian cancer survival continues to fall beyond five years after diagnosis. 35% of women are predicted to survive their disease for ten years or more, as shown by age-standardised net survival for patients diagnosed with ovarian cancer during 2010-2011 in England and Wales. Out of 20 common cancers in England and Wales, ten-year survival for ovarian cancer ranks 7th lowest (both overall and for females only). Survival for ovarian cancer is reported in Scotland and Northern Ireland,[2,3] though it is difficult to make survival comparisons between countries due to different methodologies and criteria for including patients in analyses. Data were provided by London School of Hygiene and Tropical Medicine on request, 2014. ISD Scotland. 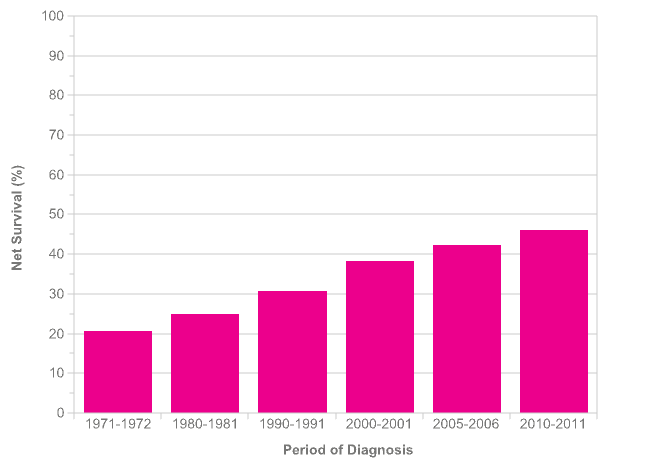 Trends in Cancer Survival 1983-2007. Northern Ireland Cancer Registry. Incidence & Survival 1993-2012. Five-year survival for ovarian cancer is highest in the youngest women and decreases with increasing age. Five-year net survival ranges from 87% in 15-39 year-olds to 20% in 80-99 year-olds for patients diagnosed with ovarian cancer in England during 2009-2013. Office for National Statistics. 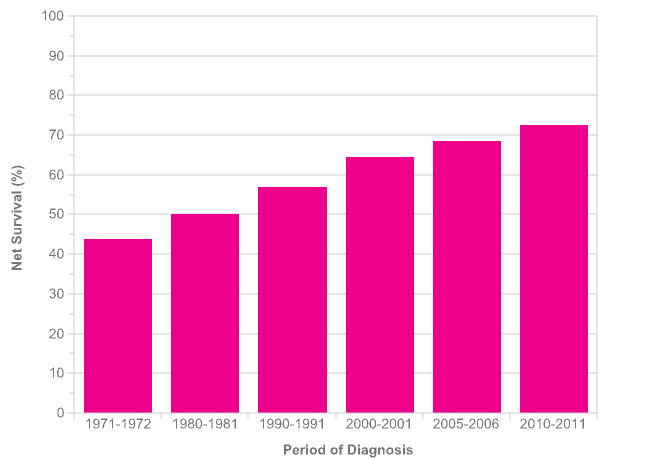 Cancer survival in England: adults diagnosed in 2009 to 2013, followed up to 2014. Newport: ONS; 2015. As with most cancers, survival for ovarian cancer is improving. One-year age-standardised net survival has increased from 44% during 1971-1972 to 72% during 2010-2011 in England and Wales – an absolute survival difference of 29 percentage points. Much of this increase can be attributed to the greater use of platinum-based chemotherapy. Five-year age-standardised net survival for ovarian cancer has increased from 21% during 1971-1972 to a predicted survival of 46% during 2010-2011 in England and Wales – an absolute survival difference of 26 percentage points. Wider access to optimal primary treatment and greater determination to treat recurrent disease is likely to have contributed to the increase. Ten-year survival has increased by a lesser amount than one- and five-year survival since the early 1970s. Ten-year age-standardised net survival for ovarian cancer has increased from 18% during 1971-1972 to a predicted survival of 35% during 2010-2011 in England and Wales – an absolute survival difference of 16 percentage points. Overall, more than a third of women diagnosed with ovarian cancer today are predicted to survive their disease for at least ten years. Kitchener HC. 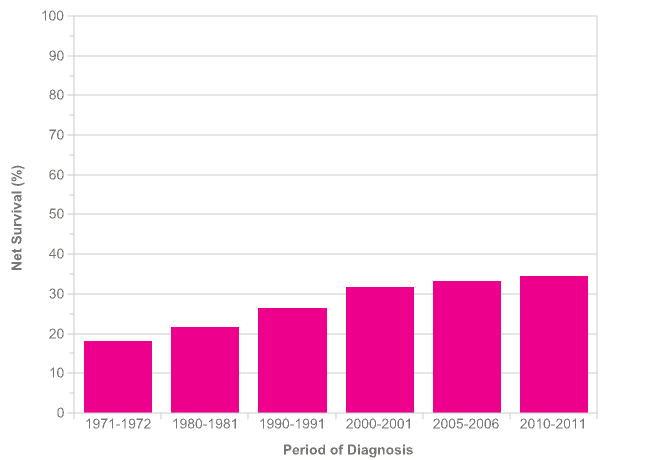 Survival from cancer of the ovary in England and Wales up to 2001. Br J Cancer 2008;99 Suppl 1:S73-4. 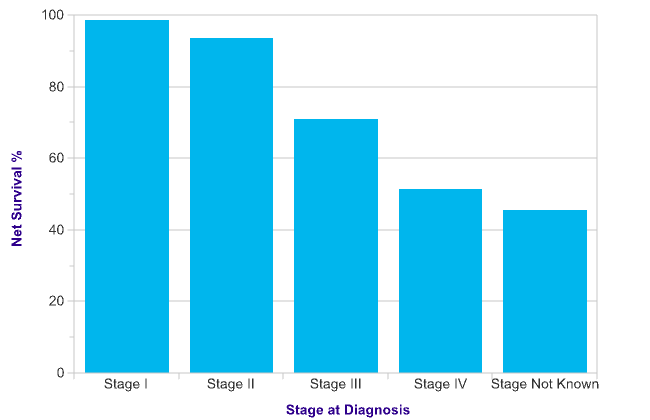 Survival for ovarian cancer is strongly related to the stage of the disease at diagnosis. One-year net survival for ovarian cancer is highest for patients diagnosed at stage I, and lowest for those diagnosed at stage IV, 2014 data for England show. 99% of patients diagnosed at stage I survived their disease for at least one year, versus 51% patients diagnosed at stage IV. One-year net survival for unknown stage ovrian cancer is 46%. Lack of staging information may in some cases reflect advanced stage at diagnosis: for example very unwell patients may not undergo staging tests if the invasiveness of the testing outweighs the potential benefit of obtaining stage information. 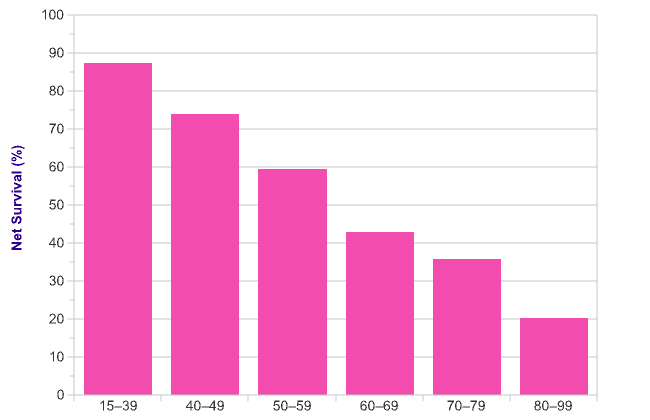 One-year relative survival is similar between women living in the most and least deprived areas, at all stages, 2012 data for England show. Five-year survival for ovarian cancer shows a much more rapid decrease in survival between Stages I and IV. 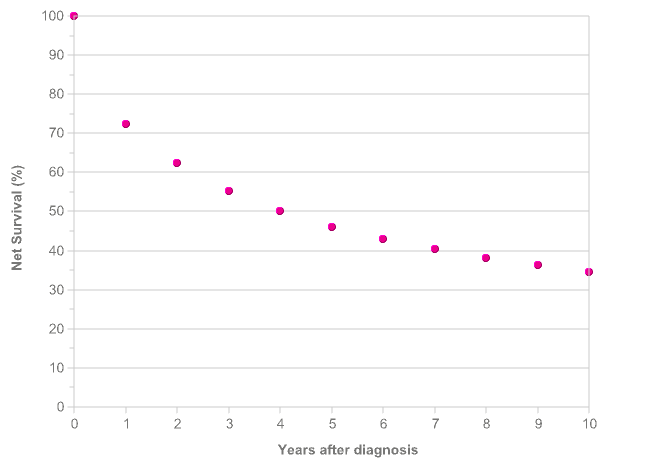 Five-year relative survival ranges from 90% at Stage I to 4% at Stage IV for patients diagnosed during 2002-2006 in the former Anglia Cancer Network. 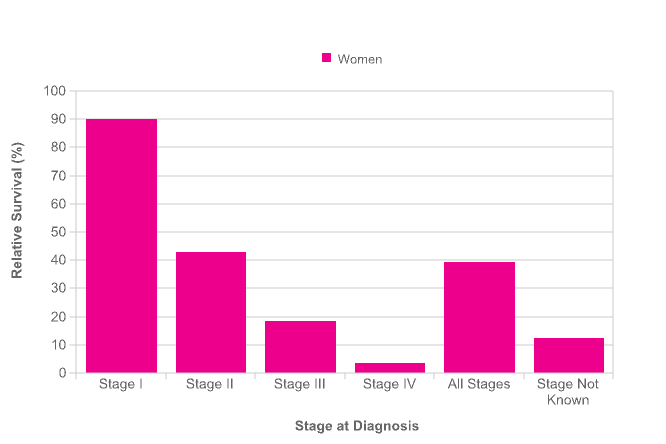 Office for National Statistics, Cancer survival by stage at diagnosis for England, 2016. National Cancer Intelligence Network. Stage Breakdown by CCG 2013. London: NCIN; 2015. Survival statistics give an overall picture of survival and the survival time experienced by an individual patient may be much higher or lower, depending on specific patient and tumour characteristics. Five-year relative survival for ovarian cancer in women in England (31%) is below the average for Europe (38%). Wales (32%), Scotland (34%) and Northern Ireland (32%) are also below the European average. 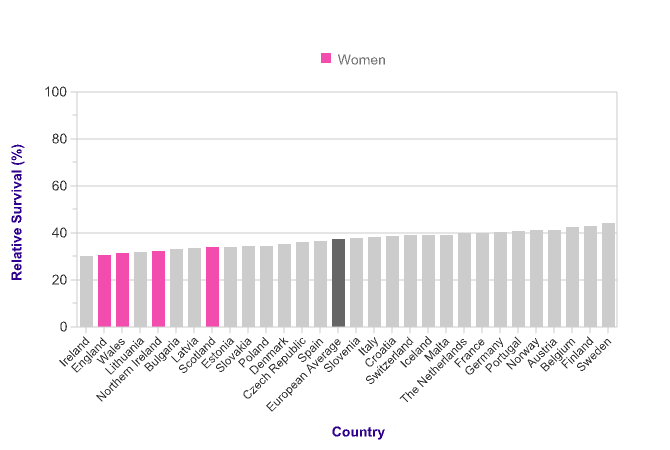 Across the European countries for which data is available, five-year relative survival in women ranges from 30% (Ireland) to 44% (Sweden). Data consists of both observed and predicted 5-year relative survival. Where sufficient follow-up was not available for recently diagnosed patients the period approach was used to predict 5-year cohort survival. Possible explanations for persistent international differences in survival include differences in cancer biology, use of diagnostic tests and screening, stage at diagnosis, access to high-quality care, and data collection practices. Data is for: 29 European countries, patients diagnosed in 2000-2007 and followed up to 2008, ovary and uterine adnexa cancer (C57.7).